Wish You Were Here? Butterflies holidays workshops with Michelle Dee. On one of the hottest weeks in June, Butterflies members took part in a holiday-themed event. Group members at Derringham branch and Cottingham branch, welcomed spoken word artist Michelle Dee to explore holidays, day trips and family visits in a fun light-hearted session. 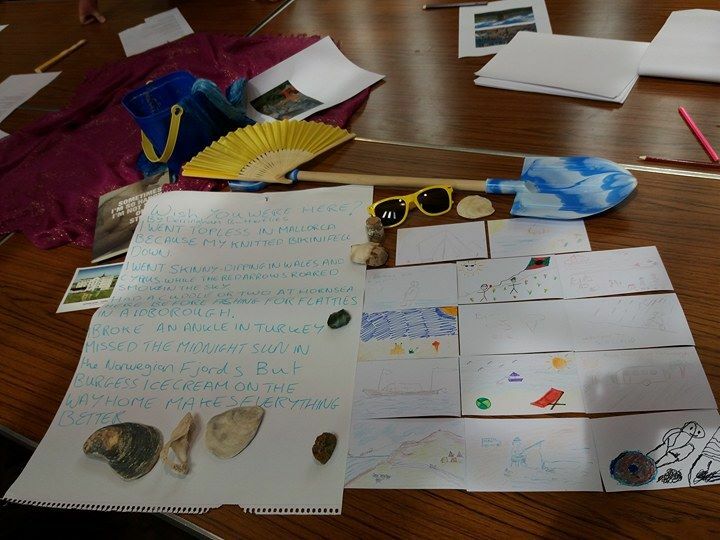 Using props including sunglasses, bucket and spade - containing pebbles and shells from Bridlington and Scarborough - she created a centre piece to evoke a trip to the beach. Sharing some of her own favourite verses, she read a number of poems including the wonderfully evocative ‘From A Railway Carriage’ by R.L. Stephenson. This poem in particular, seemed to chime with the group, with one member wanting to take a copy of it home with them. Also proving popular was the rural meanderings set down in words by Dean Wilson - his funny poems about deck chairs and trips to Hornsea sparked all manner of reaction and conversations. These moments of connection are so important to pick up on, and cannot be planned for, just appreciated and responded to in the moment. Michelle also used a series of colour pictures depicting holiday scenes, camp sites, cruises, safaris and spoke a little about some of her own holidays to introduce different ideas. The group responded well and after an impromptu game of pass the hat, to the sounds of the summery soundtrack - she had encouraged summer hat wearing - the group began to offer up ideas, that eventually became lines in the finished poem. In addition to the poems and looking at the pictures, Michelle added the sense of touch to the session. Different textured pebbles and shells were passed around the group and some used these objects to inspire words and pictures for the blank postcards. The postcard idea was a winner - the groups always seem to enjoy expressing themselves creatively. With felt tips and coloured pencils wonderful coastal scenes were drawn, cycling holidays, camping, the ubiquitous beach scene all aspects of holidays were roundly discussed and included. The two poems are very different, but both reflect the way the groups engaged positively, with the subject matter and the light-hearted way Michelle presented it. 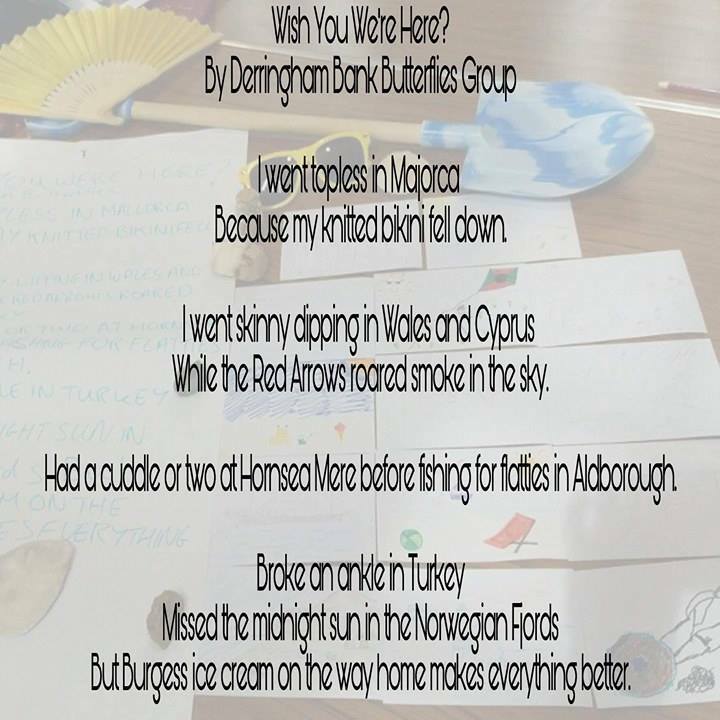 The first poem from Derringham branch is a little cheeky, a bit like a saucy seaside postcard, but entirely of the group’s own making. These are the lines, thoughts and ideas they wanted including. The Cottingham group poem was more geographic and more detailed perhaps. There was an emotional connection for one of the ladies in Cottingham, when she described the ferry, going across the Humber, and the way she used to comfort a relative who would get frightened. She wrote about these feelings on the back of her postcard - and took it home with her, clearly something had been triggered. 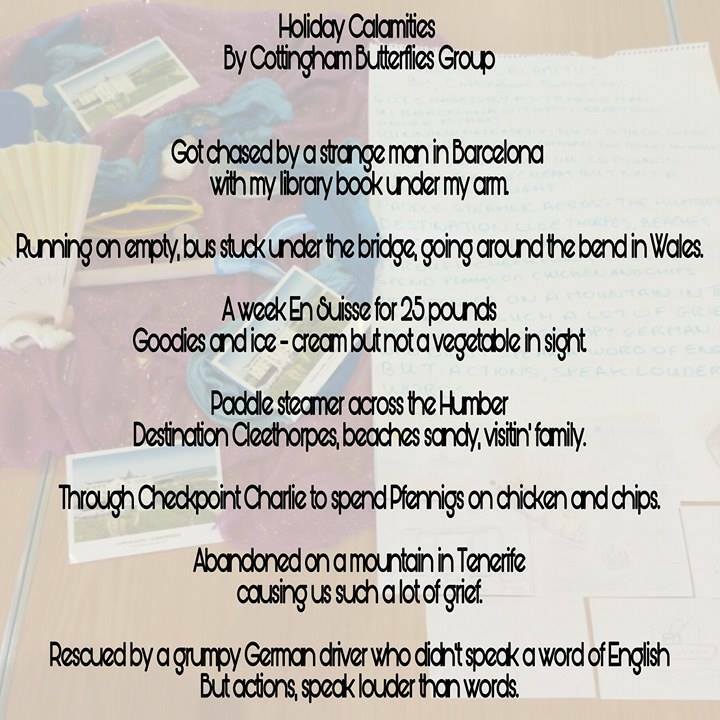 The session led by Michelle was allowed to flow and meander wherever the group wanted it to, but both groups still managed to produce a poem and series of postcards, relating to the holidays theme. As a special treat Michelle had ice creams, brought out for all the Butterflies members, which proved to be a popular move. Michelle appreciates and acknowledges the support of regular Butterflies staff Sara and Rachel and the volunteers at both Derringham Church and Cottingham Methodist. By sharing the poems and pictures on social media, the two group’s activities were appreciated on the day and days after, and a wider message about the work Butterflies does was able to be spread further. We welcome the news that the work from the session, is to be included in the church newsletter.